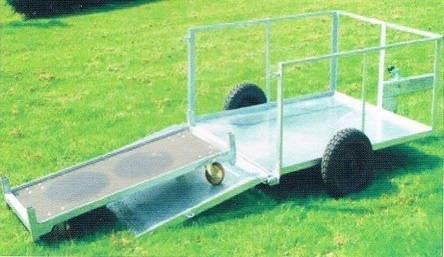 Internal use Danish Trolley Trailers. Six models to transport 2 - 12 trolleys with a 1000Kg - 5000Kg loading capacity. Platform size to suit Trolley numbers. Security chains on all models. Draw Bar hitches to suit towing vehicle. All weather canopies to order. Wheels 40/45cm steel centre four stud wheels. Tyres to suit loading.